Latest Alerts: RPVT 2019 Online application form has been uploaded. Candidates can apply online and Scroll down to apply online for RPVT 2019. RPVT 2019 Online Application Form – Released! Rajasthan Pre Veterinary Test 2019 Online application form is now issued. 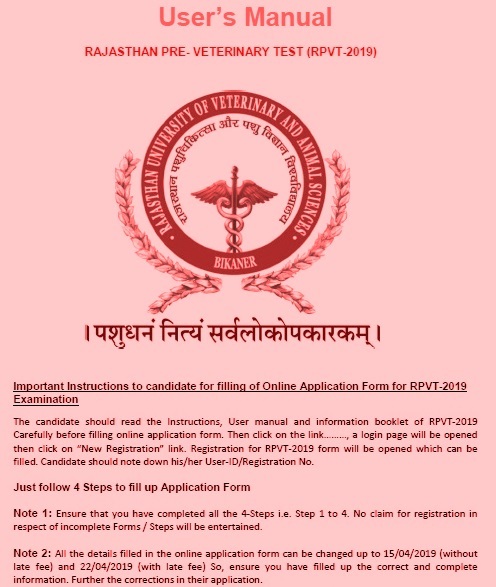 Candidates can apply online for RPVT 2019 Exam. Candidates can fill the application form. RPVT 2019 online application is available in online mode only. Candidates are advised that read RPVT 2019 information bulletin before apply online for RPVT 2019. There will be 180 question ( Physics 45, Chemistry 45 Biology (Botany and Zoology) 90 ). The total duration of RPVT 2019 Test is 03 hours. The language of the RPVT 2019 question paper booklet will be Hindi and English. 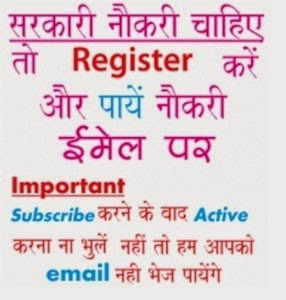 Alerts: वेटरनरी विश्वविद्यालयय स्नातक प्रथम वर्ष में प्रवेष के लिए काऊंसलिंग तिथियां घोषित.... वेटरनरी विश्वविद्यालय में बी.वी.एस.सी. एण्ड ए.एच. पाठ्यक्रम (सत्र 2018-19) के प्रथम वर्ष में प्रवेष के लिए आर.पी.वी.टी. के आधार पर काऊंसलिंग का कार्यक्रम घोषित किया गया है। केन्द्रीय स्नातक भर्ती बोर्ड के अध्यक्ष ने बताया कि दिव्यांग (हैण्डीकेप्ड) केटेगरी के पात्र अभ्यर्थियों को 28 अगस्त 2018 को प्रातः 9 बजे राजुवास बीकानेर के क्लिनिकल मेडिसिन विभाग में काऊंसलिंग के लिए व्यक्तिषः उपस्थित होना है जहां सीट आंवटित करके मूल प्रपत्रों की जांच और फीस आदि जमा कर प्रवेष दिया जाएगा। 31 अगस्त 2018 को काऊंसलिंग के द्वितीय चरण के लिए पात्र अभ्यर्थियों को काॅलेज व सीट आंवटन हेतु आॅनलाइन ही आंवटन पत्र जारी किये जायेंगे। जिन्हें अभ्यर्थी राजुवास वेबसाइट से प्राप्त कर सकेंगे। इन सभी सीट आवंटित अभ्यर्थियों को 4 सितम्बर 2018 प्रातः 9 बजे वेटरनरी विश्वविद्यालय आॅडिटोरियम, बीकानेर में काऊंसलिंग के लिए व्यक्तिषः उपस्थित होकर सभी महाविद्यालयों में प्रवेष के लिए मूल प्रपत्रों की जांच कर प्रवेष दिया जाएगा। इसी दिन अगली काऊंसलिंग से पूर्व की सीट आंवटन की काॅलेज प्राथमिकता के विकल्प भी लिये जायेंगे। 7 सितम्बर 2018 को तीसरी काऊंसलिंग की सीट आवंटन के लिए पात्र अभ्यर्थियों को आवंटन पत्र आॅनलाइन राजुवास की वेबसाइट पर उपलब्ध करवाये जायेंगे। इन सीट आवंटित अभ्यर्थियों को 11 सितम्बर 2018 को प्रातः 9 बजे से वेटरनरी विश्वविद्यालय के आॅडिटोरियम में अभ्यर्थियों के मूल प्रपत्रों की जांच कर फीस आदि जमा कर प्रवेष दिया जाएगा। चैथी काऊंसलिंग के लिए पात्र अभ्यर्थियों को आवंटन पत्र 14 सितम्बर 2018 को वेबसाइट पर उपलब्ध होंगे जिनकी काऊंसलिंग 18 सितम्बर 2018 को प्रातः 9 बजे से वेटरनरी विश्वविद्यालय आॅडिटोरियम में होगी। जिसमें अभ्यर्थियों के मूल प्रपत्रों की जांच के बाद प्रवेष दिया जाएगा। अभ्यर्थियों को द्वितीय काऊंसलिंग के बाद नियमित रूप से राजुवास वेबसाइट को देखकर सूचना प्राप्त कर लेनी चाहिए। The 1st round of counseling registration starts from 16-24 of August 2018 with college allotment letter issue along with the counseling allotment letter, Filling of Online Choices of Colleges starts from August 2018 and 1st round counseling allotment letter going to flash on 28th August 2018 also list of provisional admitted candidates after 1st & 2nd round counseling commence and vacant seats counseling held in 2018. Last year the Revised Seat Matrix category wise split will post in 2017 and 2nd round display of seat allotment lists of candidates with colleges on website and issue of college allotment letter online and reporting for the concerned institute/ college as per schedule. This year 1st round of counseling reporting by all the Physically Handicapped category candidates in person at the office of the Convener RPVT-2017, Department of Clinical Veterinary Medicine, College of Veterinary and Animal Science, Bikaner for verification of original documents, medical check up and seat allotment to eligible candidates with deposition of fees etc onward. 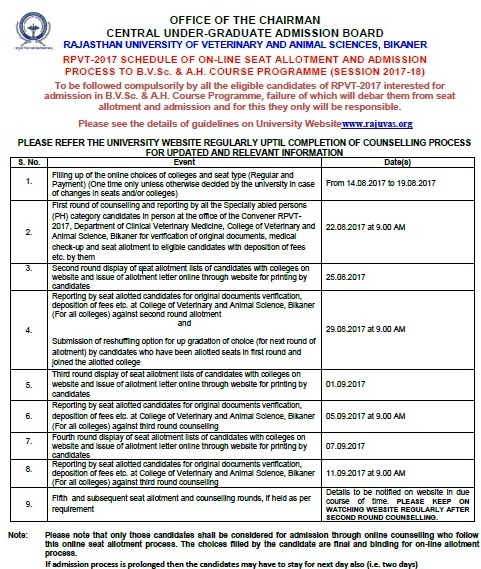 Now Filling up of online choices of colleges seat type (regular/ payment) from 14.08.2017-19.08.2017 up to 05.00 pm.…………………………..
On the basis of merit through a AIPVT competitive entrance examination conducted by Veterinary Council of India, New Delhi. 10+2 examination/equivalent examination conducted by an Education Board/University/Council (duly recognized by the Rajasthan Board, CBSE, New Delhi) with not less than pass marks in each subject and not less than 50% marks in the aggregate of English, Physics, Chemistry and Biology. However, in case of SC/ST candidates, minimum aggregate required is 40%. OR Any examination of a University/Education Board/ College/School in a foreign country recognized by the Academic Council as equivalent for the purpose with good knowledge of English. 17 years on or before the 31 December of the year of his/her admission to the 1st year of B.V.Sc. & A.H. course. 1. 85% of sanctioned seats are reserved for Rajasthan domicile candidates. 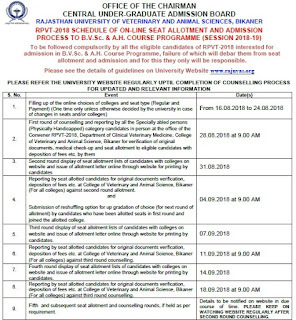 Notification for admission to the B.V.Sc. & A.H. degree course in Constituent and Affiliated College(s) of Veterinary and Animal Science of this University will be invited on line in each year in the month of Jan-Feb through AIPVT. 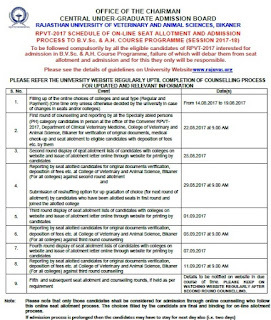 Download Process of RPVT 2018 Counseling College Allotment Lists: 1st of all go to www.rajuvas.org and navigate for rpvt counseling dates and click on link college seat allotment. Then student have to enter its details like registration no., use name, date of birth, the rank wise order of colleges based on score card display in front of your screen. Registration form Last date of deposition of fee through Challan - 19-08-2017 till 5.00 PM. How to Download RPVT Exam Results? 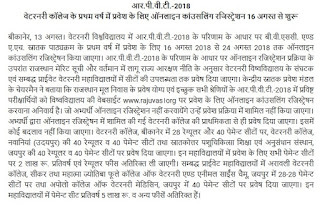 All examinees of Rajasthan domicile through OAP (Online Answer Key Portal) for RPVT (Rajasthan Pre-Veterinary Test) 2018 Test is taken to get admissions in B.V.Sc. and A.H. 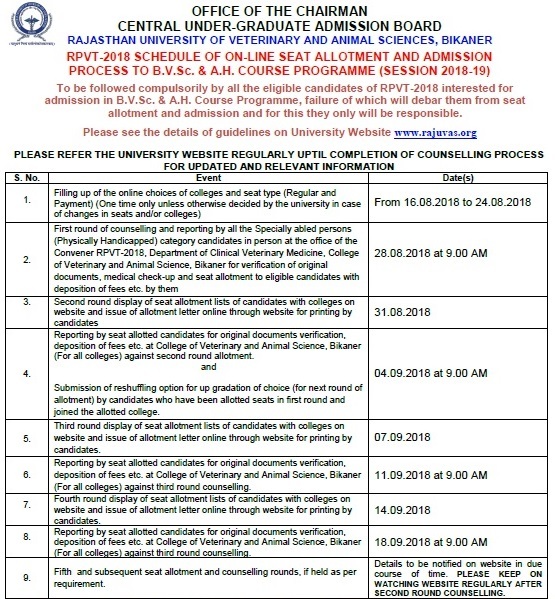 Degree Course Admissions for Session 2018-2019 in the recognized Colleges of the Rajasthan University of Veterinary and Animal Sciences Bikaner. The RPVT entrance exam is conducted by RUVAS and admission through AIPVT – 15% of the total number of seats. These seats in each veterinary college are reserved to be filled on an All India basis. The last date of submission of applications for RPVT is 2018. How to Check RPVT Exam Answer Key? How to Download RPVT Exam Admit Card? 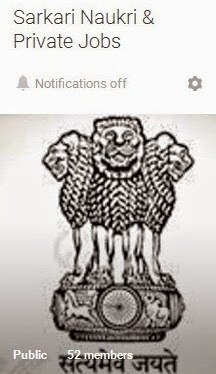 I got 142 provisional rank in RPVT-18 and Category-OBC. Do I have any chance to get Regular-UG seat in any government college? What is our Neet score?